A recent sell off of energy stocks provided excellent opportunity to add a few good dividend stocks to investors’ portfolios for great prices which may not repeat again. Well, I wouldn’t say that they wouldn’t repeat again as the opportunity of purchasing Legacy Reserves for this great price actually repeated again. I had a few candidates to buy and couldn’t make a decision but then I decided to go with Legacy Reserves (LGCY) Company. I purchased this stock some time ago in my TD account and now I am adding this stock into my ROTH IRA account too. When I was buying this stock a year ago the stock was trading at $27.10 a share and offered a nice yield of 8.55% at 12.10% growth. Today, the stock is selling for $12.50 a share and the yield skyrocketed to 17.80%. And it is all because of oil and natural gas sell off we saw recently. There are some concerns about the ability of the company to sustain its operations and mainly its distribution level if the prices of oil stay this low for longer period of time. I don’t believe energy cost will stay this low for a long time. It has never stayed that low in history. In 2008 oil prices fell from 140 per barrel to below 40 a barrel. The fall took almost the whole 2008 year time period, but in 2009 we saw a recovery to 110 a barrel. During that period of time Legacy was able to sustain its dividend policy (unlike some others). Today, we are approaching those same levels as in 2008. 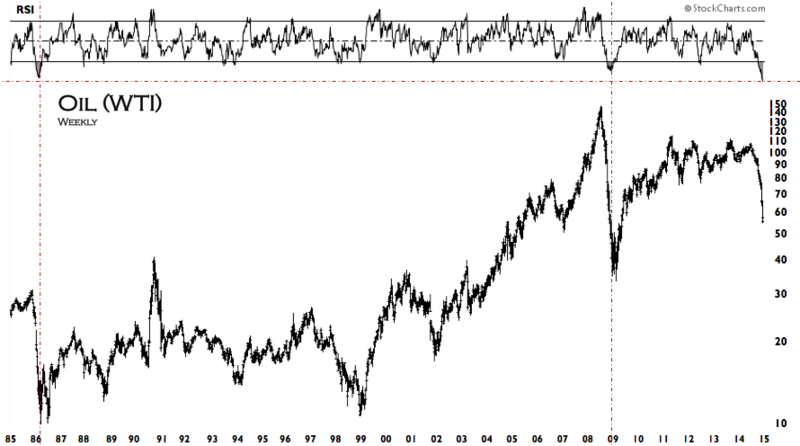 Oil is close to $50 a barrel, but if you take a look at RSI, we are in an oversold territory, deeper than the one in 1986. Will this mean that we are seeing a bottom? Maybe, maybe not. Nobody knows. But I would say we may see a recovery. It may be a slow one, but recovery. The reason why I see this as a chance for recovery is the magnitude of the oil price fall. When the decline was more like sequential, step by step, then the recovery was slow too. Whenever the oil fell like a rock, the recovery was faster. I hope that this pattern will repeat. Even if not and a recovery will be slow and painful, I believe that LGCY management will be able to react to it and adjust their portfolio and hedging accordingly. 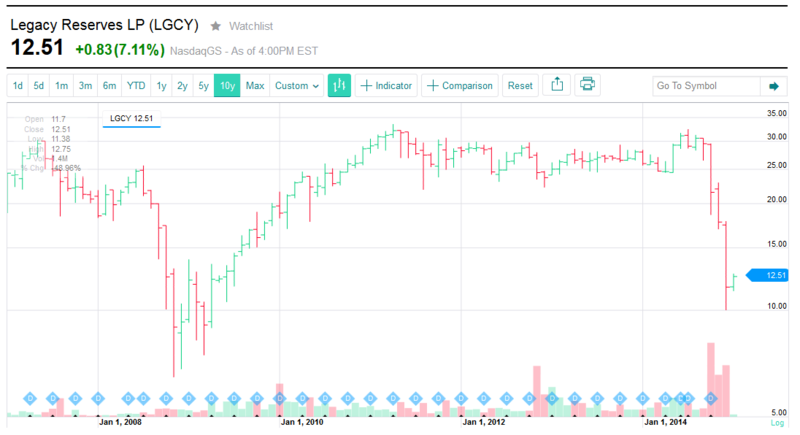 The stock of LGCY fell down hard along with oil prices and it was selling a bit over $10 a share. I wanted to buy at that point, but I didn’t have cash available. I use a strategy of saving free cash in a commission free ETF (in this case I use RWX fund). Every penny I save, every dividend I receive, I save in RWX by buying even one share of this fund. It is free with no commission. After I save $1200 I then sell shares of RWX worth of $1000 and use that money to buy a dividend paying stock. While saving and waiting for my minimum amount for a new purchase, I collect dividends from RWX. There is however a limitation with this commission free ETF. You must hold for 30 days before you can sell shares. If you sell before, you will be charged a penalty and commissions. Today, I cleared this limit and was able to sell shares of RWX to release cash to buy LGCY stock. If Legacy will do what it did in 2009 then I should see a great capital gain and collecting nice dividend in the meantime. I was thinking purchasing CVX, but later decided to go with LGCY. What do you think, was is better to buy CVX instead or is LGCY a good purchase? If Legacy Reserves is able to maintain even a third of that dividend, I think you made the right choice. Collect that 17% for awhile and then I’d be happy with it dropping to 5-6%, especially if that drop is caused by the stock price increasing, giving you unrealized gains on top of it. However, anything over 10% scares me so I probably would have stuck with CVX. Also, are you concerned at all about putting an MLP, which already has beneficial tax properties into a tax-free account? PS I’m getting an Error 403 when I try to comment from my phone. It may be because I do not see the “Confirm you are NOT a spammer” selection on the mobile version. I can email you screenshots of the errors, including a technical support key, if you want. Also, are you concerned at all about putting an MLP, which already has beneficial tax properties, into a tax-free account? PS, I tried entering this comment on my iPhone and got a 403 error. If you want to be emailed a screenshot of that error (with the technical support key), let me know. I’ve actually run into this same error pretty much everytime I try to enter a comment on a mobile device. You know, the problem might be that I cannot see the “Confirm you are NOT a spammer” button on the mobile devices. Thanks for commenting. I agree on your assessment ans that was my expectation when deciding whether to buy LGCY or not. This high yield was caused by a huge drop of the stock price not by unreasonable dividend increases. Of course, such yield may become unsustainable if the oil stays at these low levels as we could see these days. But I do not expect oil staying this low forever. So there are two scenarios: 1) the stock rises back to its previous levels and the yield will naturally drop. In that case I still will be collecting around 17% on invested dollar. Or – 2) the oil stays this low for a long period time (from what I have read, it would have to stay this low beyond 2016 in order to cause problems to LGCY) and this dividend becomes unsustainable and will be cut to more usual level of around 8%. In that case I still will be getting a decent dividend (distribution to be accurate). And on top of that I believe I will get the capital gains. As far as the commenting from mobile devices goes, I will try to look at it and see what I can do. Well my conservative nature would have gone with CVX. I like to sleep at night and LGCY would keep me up. Anytime I see double digit yields I see red flags. I don’t care about numbers, management or whatever story you’ll read that things are OK. For me, 10%+ yield is something I’m not interested in. I hear you. However, this yield was caused by a huge drop in price not by fundamental changes. This baby was normally yielding around 8%. Of course, it can all change if the oil price stays this low for longer time than I expect.